Kyle Taylor and Aaron Burgess are the new owners of the former Mt. Vernon Automotive. Come see the outstanding customer service from our staff. We focus on servicing our customers when it’s most convenient for them. Emergencies happen, and schedules are busy, which is why we offer automotive services 24 hours a day. That’s right! Your service, your time. There is an ASE Master Certified technician on hand at any time of the day or night. K&A Mt. Vernon also possesses one of the most technologically advanced vehicle diagnostic tools on the market. This doesn’t just allow our technicians to diagnose accurately and quickly. It also gives us the ability to perform factory programming on any year, make or model vehicle. We are one of only four shops in the Wichita area that own this tool. Our shop management system is also a top of the line. Factory service information is updated daily through our software to assist in factory specifications, diagnosis and repairs. One step into K&A Mt. 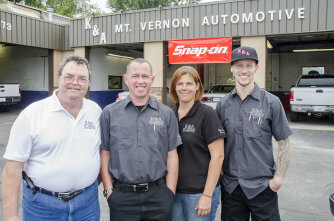 Vernon and you will recognize that we strive to be the best in the auto service and repair industry. Stop in today and check out our newly remodeled customer waiting area, bathroom and front lobby. We’re a clean facility with complimentary coffee served daily!